AppWorks would like to announce the new version of Matt Navarre’s highly-acclaimed fmSearchResults for FileMaker! 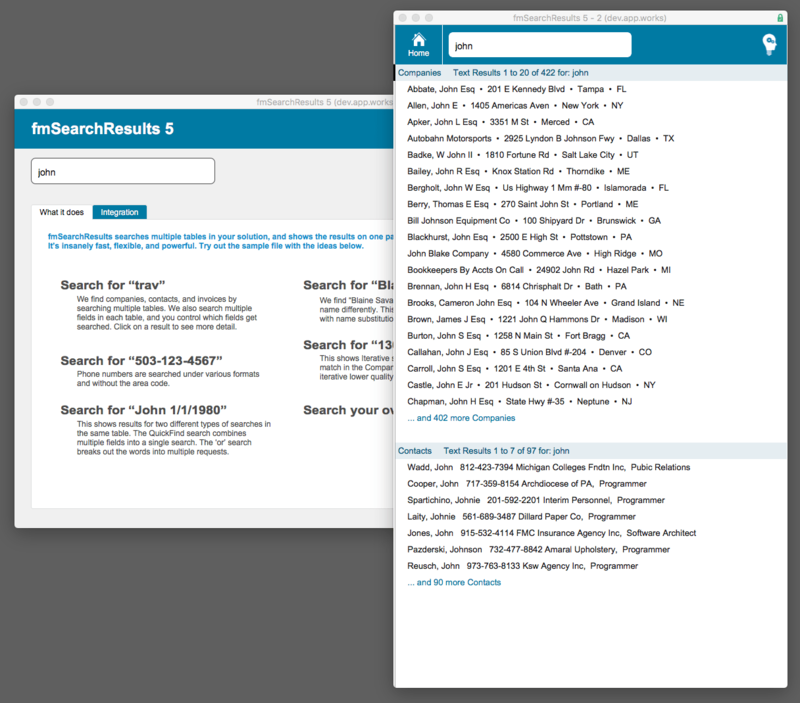 fmSearchResults 5 download delivers many new features, greatly simplified implementation, a new theme, natural triggered search, and faster performance. But the biggest new feature is the price — it’s offered as a free download under a Creative Commons license. Yeah, I know. How can you really be excited about something like FileMaker portals? And what is a portal anyways? Well, maybe YOU can’t get excited about them, but we at AppWorks can, and I’ll tell you why: Because portals are used all the time in FileMaker development, and there are two huge new time-saving options in the FileMaker 17 portal creation dialog box — “Show records from Current Table” and “Show records from New Add-on Table”. Each of these options on its own can save us an hour or more of development time, up front, which makes the initial setup of a new file much, much quicker, especially considering how frequently portals are used in FileMaker projects. Which means we can spend more time on the fun stuff, like improving the UI, adding features, and refining the user experience, and all for the same end cost.